These three, nectar rich, herbaceous perennial daisies are outstanding for their attraction to insects. Here a hoverfly collects nectar. 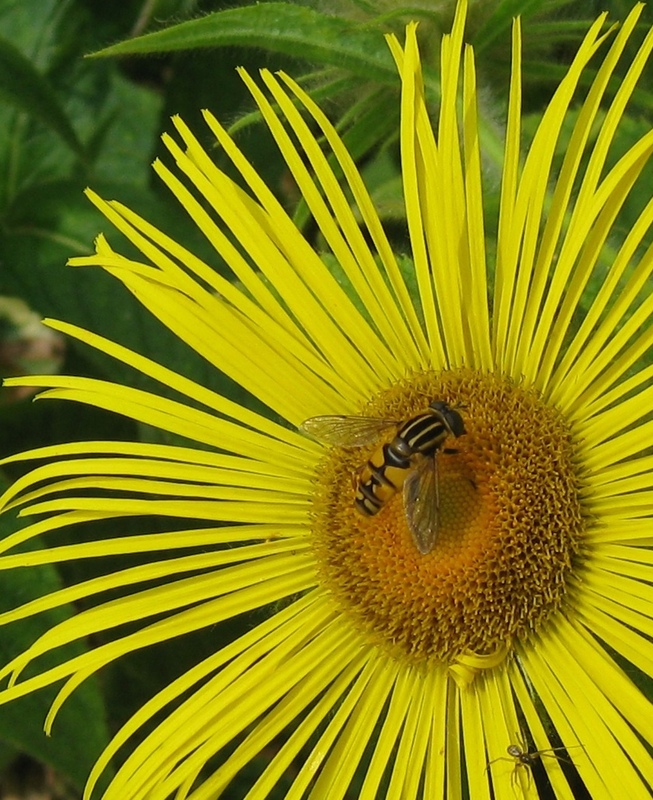 Hoverflies are bad news for the aphids. Spot the little spider scurrying away. Those gardens that have a continuity of flowers and a wide range of plants are a wonderful habitat for insects. Sadly, natural habitats are in decline and nature herself sometimes lacks a garden’s diversity. I have thousands of flowers in my four gardens, many hundreds are different and some are native. They grow mingled together just as in the wild. Insects seem to enjoy my gardening ways. Great pictures! 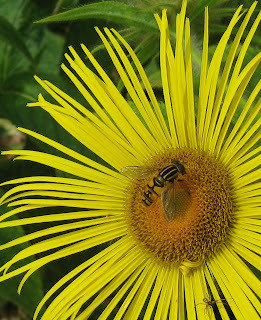 I have noticed that bees seem to prefer single flowers rather than doubles - perhaps that's why they love daisies. Certainly on my dahlias, the singles are humming with bees, whereas the doubles have scant insect traffic at all! Has anyone else noticed this? You are absolutely right. There is an interesting botanical explanation for this. To a botanist daisy 'flowers' are actually not true flowers but inflorescences (collections of flowers). The true flowers are of two types,the central tubular ones which are rich in nectar and pollen and the outer flowers which are strap shaped and act as petals in other plants. The outer ones produce very little or no nectar and provide the initial visual attraction to pollinating insects. Plant breeders select dahlias for strap shaped 'petals' to create double 'flowers'. No nectar means insects quickly move on! Or you could put it much simpler by just saying that most double flowers are just too elaborate for bees. Many are bred without male and female parts, while others have so many petals that bees can't get to the nectar. This is the main reason why single dahlias are popular with many bees, while doubles are usually ignored. Great answer Oscar. I came in via YWT and agree wholeheartedly with your assessment of modern flowers. However, if one is into plant physiology rather than just gardening, there are some excellent illustrations on Wiki. Yes great reply Oscar and thank you Maddie. My own reply was a little self indulgent but I do find it fascinating that daisies are an inflorescence. I have in my head an image of a daisy's central tubular flowers as little nectar filled honey pots that attract the insects. Indeed. As are dahlias. A poetic response nonetheless. An interesting aside is that lettuce is from the same Asteraceae family. Thanks again Oscar. When I wrote the blog I wondered about saying how wonderfully large and diverse is the daisy family. My mind then seized up at the thought of explaining that in my day, the family was Compositae and now it is Asteraceae! Dear me, I would have thought THAT would certainly be enough to put off almost all your readers! I came in on the Butterfly Conservation FB link - the first picture of the tatty Admiral is lovely. 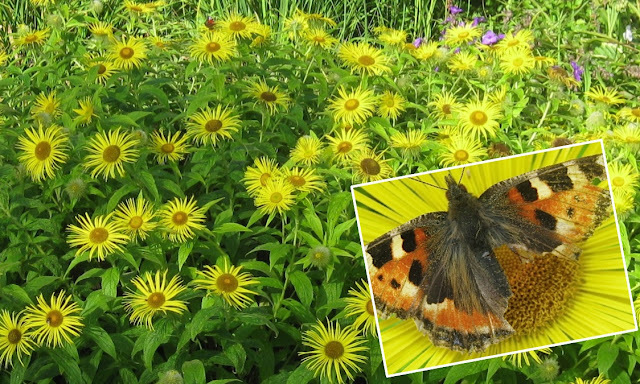 Butterflies need all the help they can get this year from wildlife gardens. Thanks for the comment Eva. 'Her indoors" Brenda takes the credit for the picture.